Job ads for scrum master or agile coach positions reveal a great insight into an organization’s progress on becoming agile. To gain these, I analyzed more than 50 job ads for scrum master or agile coach positions. Learn more about what makes job ads such a treasure trove with the following 22 scrum master anti-patterns. Probably, you are considering a position as a scrum master or agile coach in a particular organization. 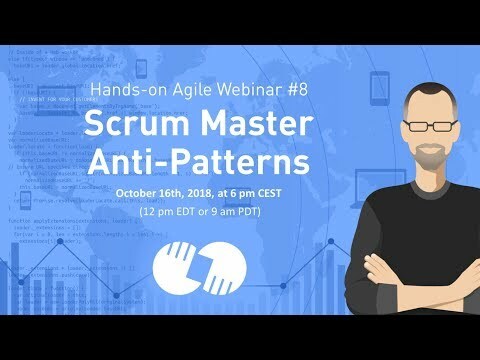 I suggest that before going all in (the application process), you should consider analyzing the job description for scrum master anti-patterns first. Usually, the organization’s HR department will create the final text of the job advertisement and post it to the chosen job sites. Hopefully, and depending on their process and level of collaboration (and agile mindset) in the organization, the team for which the new position was advertised may have participated in creating the job ad. This certainly avoids advertising a wrong description to prospective candidates. Too often, however, advertisements may read like a copy and paste from positions that an organization’s HR believes to be similar to that of a scrum master (for example, a project manager). Or, sometimes, the HR department copies from other scrum master job ad which they believe correctly reflect the requirements of the organization. So, don’t be too surprised to see a job advertisement that reads like a list of scrum master anti-patterns. Be aware, however, that if an organization which claims to be agile is using this kind of advertisement despite being well underway on its agile transition, it then raises a red flag: miscommunication in the hiring process may indicate deeper issues or problems at the organizational level. It could be as critical as someone at management level, to whom the new scrum master would likely report, having no clue what becoming agile is all about. Scrum mom: The scrum master is removing impediments on behalf of the team. (How is the scrum team supposed to become self-organizing if the scrum master handles all obstacles?). Siloed in doing agile: There is no mention of the scrum master either coaching the organization, or coaching the product owner. The job ad of the organization of your interest is a best-of of scrum master anti-patterns. Should you in this case immediately drop your interest in becoming a member of that organization? I don’t think so. An extensive list of red flags can be beneficial, too. On the other hand, the organization might just try to attract talented people by sugar-coating its otherwise command & control like management style with some glitzy agile wording. Continuing the application process under these conditions might indeed be a waste of your time. A short phone call/interview will bring clarity. What other scrum master anti-patterns from job ads have you noticed? Please share with me in the comments. Many times people have a wrong idea about the job their applying for. This may be due to the incorrect description given by the HR or the job description may not have been rightly understood by the candidate. This article has clearly explained what are job descriptions future scrum aspirants must dismiss. Where XYZ could be retain, government, banking, etc. I actually do not completely disagree that it helps if all team members are familiar with the domain but making it a condition to hire a Scrum Master is just stupid. I just read a job posting where the job title was given as “Project manager/Scrum master” which is a red flag in and of itself. The job description was completely a description of a project manager. The only way Scrum was mentioned in the description was where they said that one of the certifications they’d accept is a CSM. This is DSDM rather than Scrum, where solution development is done to time, cost and quality with the scope being reduced if necessary to meet release schedules.